rerun Oracle job and drop the Oracle job. 27475. 00000 -  "unknown %s \"%s\".\"%s\""
or the object was of the wrong type. *Action:   Specify an object of the correct type on which you have privileges. any idea on what's wrong ? I use SYSTEM account to login and run that job. privileges is not enough ? or can't find the object? Does SYSTEM own the job? The first error in both of these, the ORA-27475 error, indicates this job doesn't exist. So, it apparently was not successfully created. Or if it was created, it was not created in the SYSTEM schema. "indicates this job doesn't exist. " 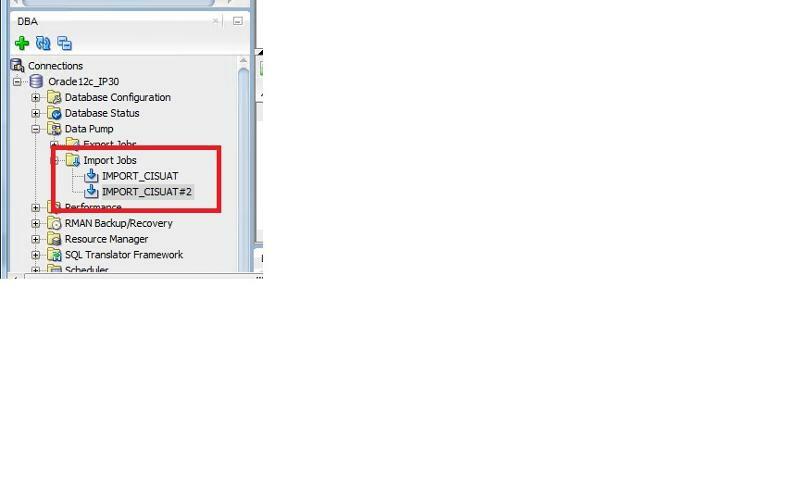 I search from SQL developer UI, it existing and it shows the status of the job! but just can't drop using command. SQL developer seems don't allow me to rerun the job from UI , it doesn't make any sense, right? 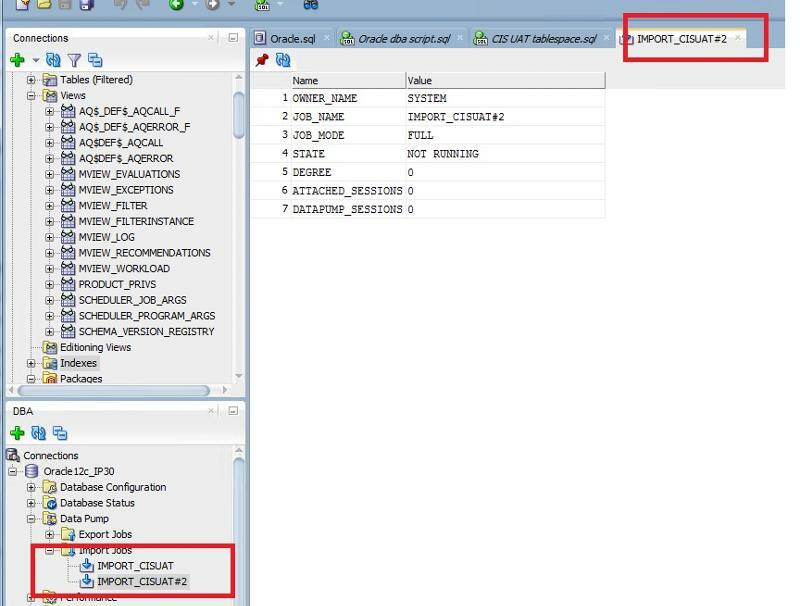 "select * from dba_scheduler_jobs where job_name = 'IMPORT_CISUAT';"
the import of DMP file from using SQL developer is much easy than using impdp ! But seems SQL developer don't allow me to delete/modify/rerun a job from UI, funny ! yeah, it shows it is there. "Sure, this is always a personal opinion, but I totally disagree ;-)"
I hate command as this is why UI invented ! command can make a lot of mistake but can say it is flexible for experienced DBA. can keep adding option. no worry ! not that far away ! it is related. 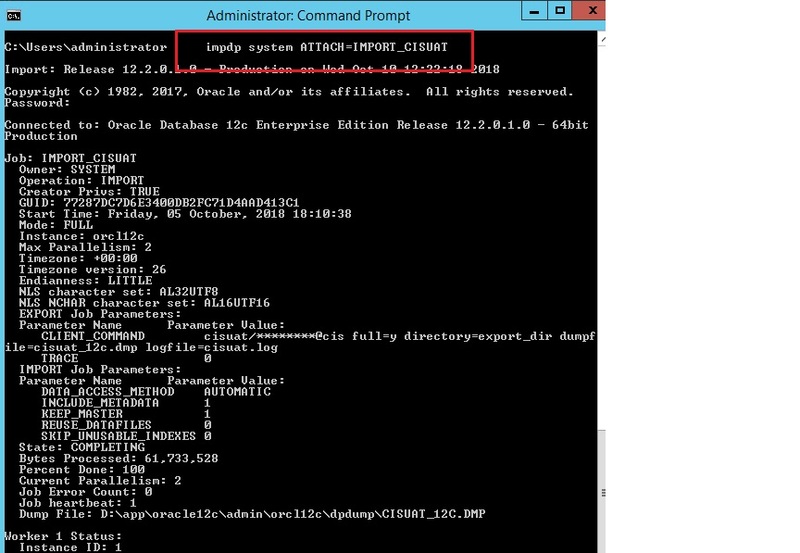 so you mean this command is not going to work anyway but oracle keep posting it ? What's your source? Please provide a link or something! What's your source? Please provide a link or something!" That's the DBMS_SCHEDULER!! And this has NOTHING to do with IMPDP and/or EXPDP! that's what I am following ! or I should read a section called RERUN a job ? but the point is , that scheduler can't even see the job, this is what the error is about. There are multiple job types in oracle. Each type is called a "job" but they are not the same things at all. You can't use functionality from one type to view or modify jobs of the other types. You are trying to use DBMS_SCHEDULER to view, run, and drop data pump jobs, but it can't do that. There is no reason to expect that it should be able to because they aren't the same types of jobs. tks , may I know how can I rerun the job created by pump data wizard ? how can I drop it too ? the dbms_datapump api is simply the START procedure. If the job is already running, use dbms_datapump to attach to the job and stop it. A datapump job is stored as a table, so to clean out the record of the job, you simply drop the table. the table name will be the same as the job name. "call the dbms_datapump apis again"
"If the job is already running, use dbms_datapump to attach to the job and stop it." You cannot rerun a job by attaching to one that's already been run!! If you paused a job, you may resume it, but if you want to rerun, you have to start a "new" job. "you have to start a "new" job." This is what I am wondering . is it the problem of oracle or SQL Developer ! a job can't rerun but resume only, make sense ? and this is what I am doing, keep creating new job ! so what is the way to drop that job ? I really don't like SQL developer much now, if using default MS SQL tools, already fix this kind of stupid and simple mistake ! in oracle still use command to drop/delete a job ? 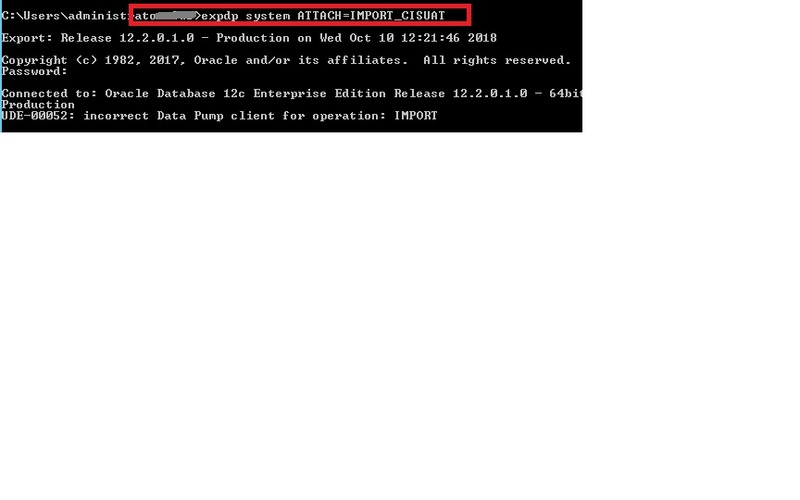 Again: you don't need to "drop" an import/export job, just use the command line tools to perform the tasks, that's it! See above! For heaven's sake: USE THE TOOLS!! See above + NO NO NO!! 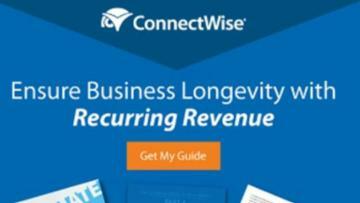 "but if you want to rerun, you have to start a "new" job." can't rerun a job, so I have to create a new one. That's just quibbling!! Just call impdp and expdp or use the corresponding UI components from your GUI! Apart from the fact that virtually all workers here have the status "FAIL", why oh why do you want to use "ATTACH=IMPORT_CISUAT"?? any arguable reasons?? I am not sure, worker 2 and 4 was success, right? I wouldn't mind either way. Again: why do you want to use "ATTACH=IMPORT_CISUAT"?? any arguable reasons?? so from trial and error point of view (as I can't see why it doesn't work,) I have to try what make it works. so by that link I try change expdp to impdp and see if it works. "If they did anything at all..."
I read it is success and I think it is making my job run again. You have to read these guides very carefully!! but I didn't kill it ! it is stopped as it ran last time. but when I check the job from SQL developer, that job didn't start at all. ok. as at this stage, it seems import is doing good.